Sensing the overall opportunities in the home décor market, prominent manufacturers are focusing on increasing capacity expansion and setting up new plants. For example, Welspun India opened a new plant in Anjar, Gujarat, India recently, and made a foray into flooring solutions segment. The facility had an annual capacity of nearly 7 million square meters, with 50% of the production primed for emerging markets. Bombay Dyeing, another prominent player in the market, is focusing on massive revamp of its home textile business by investing over US$ 15 million in the brand. The company also plans to increase its total revenues to US$ 150 million by the end of 2020. A recently published report of Transparency Market Research (TMR) has listed key companies underpinning expansion of the global home décor textiles market, which are Mannington Mills, Inc., Companhia de Tecidos Norte de Minas, Kurlon Enterprise Limited, American Textile Company, Inc., Leggett & Platt, Incorporated, Nitori Holdings Co., Ltd., Williams-Sonoma, Inc., Berkshire Hathaway Inc., Ashley Furniture Industries, Inc., Mohawk Industries, Inc., and Inter Ikea Systems B.V. 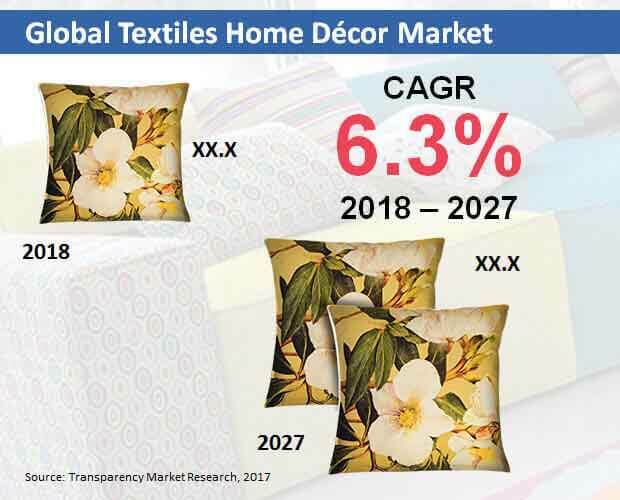 The report has foreseen the global market for home décor textiles to record an impressive CAGR over the period of forecast, 2018 to 2027. Demand for home décor textiles is expected to remain influenced by growing consumer confidence, capacity expansions by the market players, social responsibility & sustainability trends, and booming ecommerce sector. Revenues from worldwide sales of home décor textiles are envisaged to exceed US$ 185,000 Mn by 2027-end. Asia-Pacific excluding Japan (APEJ) will continue to dominate the global textiles home décor market. Emerging countries of Asia-Pacific excluding Japan (APEJ), such as China and India, have remained global leading exporters of home textiles. Manufacturers and exporters of home textiles in India have recorded higher profit margins. Government of India, realizing growth potential in home textiles, extended 60 billion rupees, i.e., over US$ 900 Mn apparel package to its home textile industry. The Chinese home textile industry is currently focusing more on garments business. Considering the U.S. home textile imports, China will continue to be dominant, with relatively larger number of shipments compared to other APEJ countries. Bed linen is expected to prevail as the most remunerative product in the global textiles home décor market, with an estimated revenue share of over 33% during 2018 to 2027. Demand for bed linen is likely to grow at a brisk pace, with a steady stream of opportunities expected to emerge in both developed and developing markets. Sensing the lucrativeness of this segment, manufacturers are focusing on consolidating their position. However, a key challenge for stakeholders in this segment is the highly fragmented presence of unorganized players. In a bid to counter the challenges from the unorganized sector, leading players are focusing on offering entry-level bed linens that are priced attractively. With over one-third market revenue share during the period of forecast, e-commerce will continue to lead the global textiles home décor market, based on distribution channels. The availability of a wide range of home décor textiles on e-commerce websites has led to a spike in sales, as a number of consumers living in tier II and suburban areas are now able to avail door-step delivery of their favorite brands. Indoor applications of home décor textiles are expected to account for bulk revenue share of the market. However, revenues from outdoor applications of home décor textiles will increase at a relatively higher CAGR through 2027.